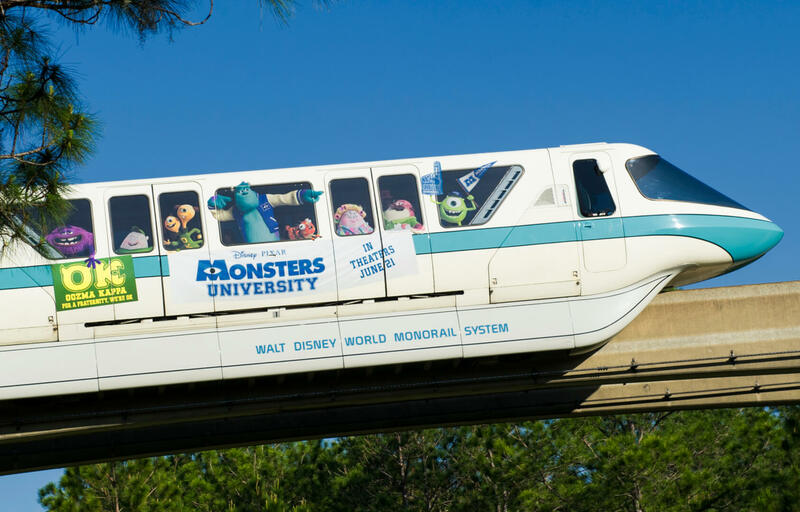 Over the next two days, Walt Disney World will be welcoming media to show off its new and upcoming creations under the banner of a “Monstrous Summer” press event. With Pixar’s prequel “Monsters University” scaring its way into theaters on June 21, Disney is using the lovable Mike and Sulley to tie it all together in a big way. 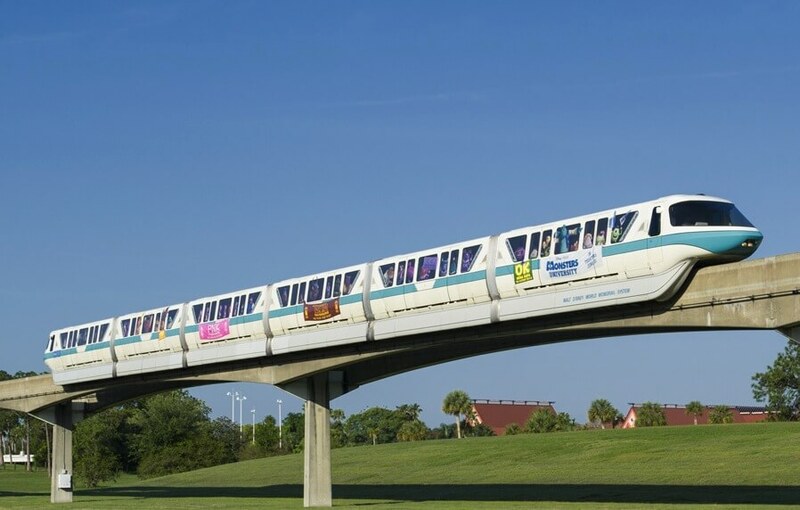 It’s the latest in a long line of recent promotional monorail makeovers that included the Iron Manorail, Avengerail, and Tronorail. But while the “Monsterail” will be circling the tracks this summer, a special spectacle is also planned for the press. Epcot’s iconic Spaceship Earth will be transformed into Mike Wazwoski as part of a “special announcement” to cap off tomorrow night’s media event. UPDATE: Here’s the big announcement moment featuring Mike Wazowski on Spaceship Earth talking to Walt Disney World president George Kalogridis, with a surprise appearance from Sulley. A video shot very early this morning was sent in today from an anonymouse source after Walt Disney World tested the Mike Wazowski projection, visible to anyone within eyeshot of Spaceship Earth. Earlier this week, eagle-eyed Epcot visitors already spotted the projectors temporarily set up near the park’s entrance to make this effect happen, even jumping to the conclusion that Mike Wazowski’s appearance would be the result. It seems, in this case, that rumor is true. Last time Walt Disney World held a major press event, they flew a fire-breathing dragon over New Fantasyland, another eye-popping event designed to grab attention – and headlines. Surely Mike Wazowski’s big appearance will do the same for tomorrow night’s announcement. And as with the dragon, it’s likely Spaceship Wazowski will be around for just one night only. Before the evening at Epcot, Walt Disney World will also be giving media a sneak peek of what’s still to come from New Fantasyland: a first look inside Princess Fairytale Hall (opening some time this year) and behind the construction walls of the Seven Dwarfs Mine Train (opening in 2014). Then continuing the Monstrous Summer fun will be an “Around Our World” press presentation Friday morning, summarizing all that’s new and exciting around Walt Disney World for the upcoming summer season, followed by further information delivered via a showcase of topics. Stay tuned to Inside the Magic throughout the next two days (and beyond) for coverage of all the excitement from Walt Disney World’s Monstrous Summer! Be sure to follow us on Twitter, like us Facebook, and subscribe on YouTube to get the latest information, photos, and video sent directly to you. NOT AWESOME! We went tonight and were told it was only going to be after hours as a press event! TOTALLY LAME!!! If you had lingered around the park and/or parking lot past closing you would have seen it. They left the projection running for quite a while tonight to allow news broadcasts to go live in front of it for the evening news. Can’t wait to hear all the things they have in store. Rumors of another 24 hour event. Ricky, as always, a great post, but this Mike Spaceship Earth projection is only tomorrow, correct? Not for the whole summer? But the Monsterail will be around for at least longer than this weekend? Thanks! Hope to see your coverage tomorrow about this event! Awesome! I wish it was going to be up in December when we go, monsters inc is my 2 yr old’s favorite movie!